These Super Seedy Power Cookies are super seedy, super nutty & super healthy. They are naturally sweetened & contain no oil, grains or gluten. Perfect for on the go breakfasts or snacks! It’s been a while since I published a cookie recipe that is healthy enough to eat for breakfast. I love making my Cranberry & Coconut Breakfast Cookies but although they are pretty healthy, they do contain maple syrup as a sweetener. I am not opposed to using maple syrup at all, but sometimes a naturally fruit sweetened treat is called for. That’s where these Super Seedy Power Cookies come in. They are stuffed full of healthy seeds and nuts and are naturally sweetened with a combination of dates and banana. My Super Seedy Power Cookies are vegan (of course), grain-free, gluten-free and paleo. I am not all that familiar with the paleo way of eating but I did google each of the ingredients to check I had my facts straight before announcing it here. It’s my first foray into paleo recipes, I think anyway. Perhaps I have some already that are accidentally paleo? Whatever is in them, or not in them as the case may be, these Super Seedy Power Cookies are delicious. They are also packed with fibre, protein and healthy fats. The combination of toasty nut and seed flavours with the sweet, chewy bursts of dried fruit is so good and they don’t taste overly banana-ey either. Is banana-ey an actual word? If it isn’t it should be! My Super Seedy Power Cookies are a breeze to make and are just perfect for on the go breakfasts, snacks or packed lunches. They are great for batch cooking too as they keep well for several weeks in a sealed container in the fridge. I hope you enjoy these Super Seedy Power Cookies. Let me know what you think in the comments below or share a pic on Instagram and tag me @avirtualvegan. Use the #avirtualvegan to be sure I won’t miss them. 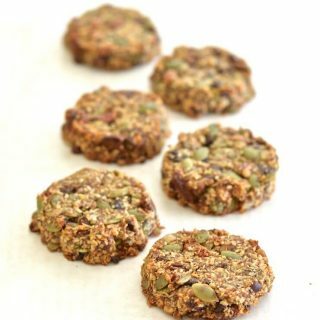 These Super Seedy Power Cookies are super seedy, super nutty & super healthy. They are naturally sweetened, vegan, paleo & grain-free. Perfect for on the go breakfasts or snacks! ½ cup walnuts or pecan nuts or a mix of both , for a nut free version just replace the nuts with any other seeds, or a combination of more seeds and more dried fruit. Just keep the quantity the same. Add the dates and banana to a blender or food processor Process/blend until a puree. Add all of the other ingredients and stir well to combine. Its a very stiff mixture so is a little difficult. I rolled my cookies out between 2 sheets of parchment paper then used a cookie cutter to cut rounds just because I wanted them to look neat for the photos but if you don't mind them looking a little more rustic you can roll pieces of mixture into balls, place on a cookie sheet and push down with the palm of your hand to flatten into cookie shapes. They should be about ½ an inch thick. I have never tried so can’t say for sure. I was craving something good and healthy. I came upon it with this recipe . I thought, why not? Let give it a try. So I just made the cookies. They came out delicious. My teenager son and my boyfriend liked them as well. I didn’t have dates, instead I used 2 tablespoons of organic cinnamon apple sauce. It worked just fine. I’m so glad you enjoyed them Leticia and it’s good to know that apple sauce worked in place of the dates. Thank you for stopping by to leave feedback! Woke up from a nap and needed something sweet. But we’ve been vegetarian ,nearly vegan, for the past f w months. I looked up veGan nut cookies and saw your recipe. I had dates, a banana, raisins, currants, and toasted sime slivered almonds, pumpkin seeds. pecans, and cashews. Added a teaspoon of cacao, left out coconut which I don’t like, and combined the ingredients, starting with the blended date-banana paste. They are in the oven. I made tea, and am waiting for my treat…. Oh… perfect. Satisfying crunch-chewy. Maybe next time I might chop the nuts for a more uniform consistency, but I’m happy with this sweet snack. No eggs or fats, and made me feel satisfied and virtuous! I just made these this morning and they are delicious. Remind me of a trail mix cookie. Be good for taking on hikes!! They are awesome for taking hiking. So glad you enjoyed them! Do you know the protein content? For some reason the protein content disappeared from the table. I just recalculated and it’s 5 grams of protein per cookie. You could probably get away with omitting them or just add in the same amount of something else. Buckwheat groats would work well or chopped nuts. I hope you enjoy them! Hi, I would like an alternative to hemp hearts. It don’t care for banana. Would a bit of prune cream or applesauce provide enough binding? Hi Anne, I think they might be a little wet to hold everything together. You could increase the amount of dates, or nut butter would probably work well too. Whatever you use you will want about 1/2 a cup. If you find it a bit dry to form cookies you could add a drop or two of water or a spoon of apple sauce and if it ends up too wet just add more seeds or a little ground flax. I haven’t personally tried it with anything else other than banana though so I can’t guarantee the results. Hope that helps. Love that it’s just banana and dates that’s holding this all together. These sound perfect for breakfast or mid-afternoon snack. I’m always questionable on paleo recipes too, sometimes I forget certain ingredients are considered paleo but looks like you’re good to go hear! Can’t wait to try these :) thanks! Just placed in the oven and hope they turn out OK. Always find cup measurements confusing, would rather have grams or ounces. Maybe the alternatives could be included on recipes? In recipes where exact measurements really matter I do always try to include grams and cup measurements. In recipes where the quantities don’t have to be exact for them to work I just use cups as it’s generally quicker and easier to just scoop them up rather than have to weigh, and slight variances don’t make a difference to the workings of the recipe. This Super Seedy Power Cookie recipe is really quite flexible with regards to what nuts and seeds are used and absolutely exact weights aren’t necessary. It’s very forgiving. With regards to future recipes like this, any cup/mug with a 250ml volume can be used to measure the ingredients. When a recipe can be either dessert or breakfast – it’s obviously a goodie!! These look amazing! A perfect hiking snack, too. These look fabulous! I love turning healthy ingredients into something that seems like a guilty pleasure. Great recipe, Melanie! Love these simple, wholesome ingredients and they are DELICIOUS! All I needed to read was “cookies for breakfast” and I’m in! I love healthy cookies packed with good-for-you ingredients. Definitely suitable for breakfast to dessert and anytime in between! They are perfect for anytime the munchies strike. Thanks Jenn! I love the texture of super seedy treats! The crunch and soft all together in one is so good. These look delicious! Yes! I can never have too much inspiration for healthy cookies! These look divine. These look so good! They’d be perfect for lunch boxes.